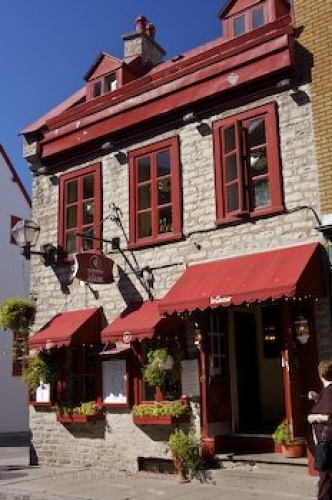 Located in the Joseph Bouchette House, a historic stone building along the Rue Saint-Louis in Old Quebec City, Canada, is the Le Cavour restaurant. The exterior of the building is done in a rustic red color with matching colored awnings, planters which flourish in the spring and summer, a historic looking sign and a menu displayed on the exterior of the building. The menu is one of continental cuisine of French and Italian meals and during the dinner hours, entertainment is provided. This building is one which has been declared as a UNESCO World Heritage Site and is properly maintained to keep its beauty. Picture of the exterior of the Le Cavour restaurant along Rue Saint Louis in Old Quebec, Canada. Exterior of Restaurant Le Cavour along Rue Saint-Louis, in the Joseph Bouchette House, 1774-1841, Old Quebec, Quebec City, Quebec, Canada. UNESCO World Heritage Site.